In tsubazeriai the omote side of the jinbu of the shinai should be crossed at the point above the tsuba. The shinai should not directly touch your opponent. Any variation to the above is classed as a tsubazeriai infringement and would earn a hansoku in shiai. From tsubazeriai push your partner’s hands upwards. As he responds by pushing down he exposes his men. Lean back slightly and step back with your left foot, making sure that you create sufficient distance to strike the men with the datotsu bu of your shinai. As you strike men you should pull your right foot back, making fumikomi. Zanshin should take the form of you continuing to move back to safe distance, keeping your shinai in chudan position. Again the process is the same. This time push his hands down and hit dou as he forces them up against your pressure. I have just returned from the Sunday Mumeishi keiko and am writing this post before preparing for next week’s trip to Japan. On Tuesday we had a visit from Tajima sensei and 12 students from Shigakukan University. The energy and enthusiasm of our visitors was infectious and we enjoyed two hours of flat out keiko. I am leaving for Tokyo on Wednesday morning for what should be a short but very interesting trip. I am meeting up with a number of Mumeishi OBs in Tokyo and also planning to visit Chiba sensei when I arrive on Thursday, then the hard work begins. On Friday I check in for the 16th WKC referee’s seminar in Narita to become one of 36 referees who we will spend two days together improving our refereeing technique and learning to work as a team. So far I only know the names of the other eight members from Europe and can only guess who has been selected from the Americas and Asia zones. I am confident however that it will be a tough but valuable learning experience. The format of previous WKC Referee Seminars has been for referees to officiate in real matches between “All Japan” level competitors from either the university or police sections of the ZNKR competition groups. Last time the organisers had also invited some nito players. The process is overseen by hanshi level instructors and shinpans’ errors and misdemeanours are examined and discussed in minute detail. It is expected that at this level, referees can correctly judge yuko datotsu and move as a group so that each has a clear view of the players. The aim of these seminars is to hone these skills to a level where there is complete consensus. I have been told that this year emphasis is being placed on correct shiai etiquette and tsubazeriai, so there may be a lot of instruction and discussion on the role of hansoku and the balance between managing correct discipline and the smooth running of the shiai. Obviously spending only four days in Japan is far from ideal, and as I am straight back to the office the day after I return home, there might not be time for next week’s blog post. I am sure that there will be some interesting information to pass on the following week. I am looking forward to a much longer trip in May, when as well as attending the 16th WKC in Tokyo, I plan to travel to Kansai to catch up with old friends and enjoy the sights as well as some extra keiko. There may even be time for an onsen visit. As part of the interest in kirikaeshi generated by Inoue sensei’s visit to the UK, the debate on whether or not to make taiatari part of the exercise has been brought back into focus. Recently,many instructors have been teaching kirikaeshi without taiatari, as they feel that its inclusion leads to bad posture. This is particularly true for less experienced players who tend to lean forward and use the strength of their shoulders and arms when they make body-contact with their opponent. On the other hand learning taiatari equips the student to aim for the centre, to make successful hiki waza and when the chance allows, give their opponent an extra shove to gain hansoku in shiai. The clue is in the name. Taiatari means “body strike”, not “push”. To do it successfully you simply drop your hands to the height of your navel, engage your opponent’s shinai in correct tsubazeriai (omote side to omote) and push down using the strength of your back and hips. You should hit just once with the forward momentum of your attack. Your hands and arms should be relaxed, your posture should be upright and your left foot should be in the correct position following hikitsuke from the preceding strike. Taiatari almost always follows an unsuccessful strike when you are directly in front of your opponent. By dropping your hands you also ensure that you do not put him or her in danger by pushing forward with your hands at throat height, potentially causing neck injury. In shiai the rule is that a “one hit” body strike that pushes your opponent over the line, results in a hansoku in your favour; a repeated or concerted push which is not connected to a valid attempt to strike a target, could result in the penalty being awarded against you. The intention of taiatari is not necessarily to push your opponent back. With heavier opponents it may be that your aim is to gain distance by bouncing off them. It is however possible for a lighter person to gain ground with the strength of their taiatari. I have seen 45kg female player move a 100kg male opponent with a well-timed body strike. To practice taiatari we use butsukarigeiko, where we follow a forward strike with taiatari and a hikiwaza. So a possible sequence might be – men, taiatari, hiki-men; men, taiatari, hiki-gote; men, taiatari, hiki-dou. Or of course you can practise by introducing correct taiatari into kirikaeshi; which brings us back to where we started. I have just returned from the keiko after the Mumeishi 3’s. This was a full-on 2 and a half hour session with some two hundred people in attendance. 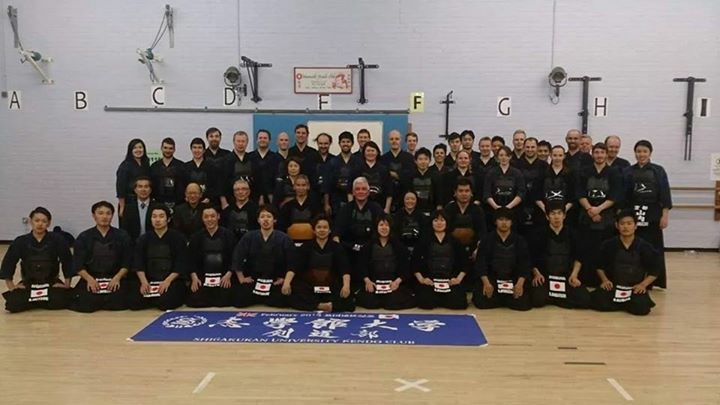 I was reminded that in my last post I underestimated the motodachi count by one seventh dan, but even with 8 of us plus one 8th dan and numerous 6th dans it was still hard work. The previous day’s taikai went without a hitch and Mumeishi’s “A” team won. This was a great way for the club to celebrate the event’s 40th anniversary. My job was that of shinpan-shunin, running “A” Court under the direction of our shinpan-cho, Sumi sensei. The overall standard of shiai was excellent and the referees did a good job in keeping everything moving. My only complaints were in the few cases where overzealous referees stopped shiai too frequently for minor points. Sumi sensei did however let me know that we should have dealt more strictly with one case of tsubazeriai infringement. Of course when a hanshi tells you something like this, you answer “yes” and make sure that it does not happen again. Sumi sensei however is a very approachable hanshi and later at the after competition party we talked frankly about how strictly the tsubazeriai rules are enforced. I mentioned that I had attended the two World Championship referee seminars this year and the instructors had made it clear what was and what was not acceptable for tsubazeriai and what counted as a clean break on wakare. In effect tsubazeri is only legal if the shinai are crossed at the tsuba on the omote side. The shinai should not touch your opponent and neither of you should touch your own or your partners jinbu. On wakare both parties should break cleanly so that the shinai are clear of each other. Nevertheless at the World Championships numerous examples of the players either covering the shinai from the ura side, or attacking before making a clean break on command were allowed by highly experience referees. Sumi sensei made the point that at this year’s Asia zone referee seminar the most asked question was “why should we penalise this behaviour when it is becoming normal practise at the All Japan Championship.” I imagine quite a difficult point to answer. There is obviously a divergence between the theory of good kendo and the practicalities of not getting beaten which needs to be resolved at the highest levels. In the meantime we can start by encouraging good kendo by enforcing the rules in our local competitions. Coincidental to my last post on tsubazeriai, I was asked some interesting questions stemming from an incident that happened at the Mumeishi 3’s Championship last weekend.According to an eyewitness report, there had been a controversial shiai, where one kendoka, had through a succession of taiatari shoves, put his opponent on the floor and then hit him across the back. I was asked for my view on the legality of such an attack and my view of the reaction of the referees. 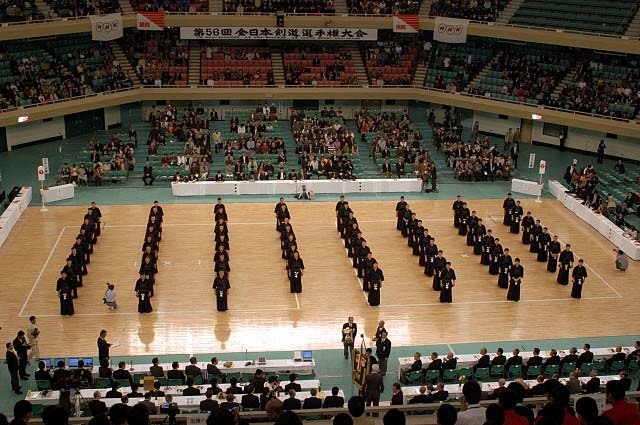 Now the Mumeishi taikai is quite popular with 3 courts and this year, 84 teams. My job was as shinpan shunin for Court A and this happened on Court C, so having seen nothing of the incident, a considered opinion was impossible. Still, thanks to the wonders of the internet and the digital camera, someone had captured the action and posted it on YouTube. Having held back for as long as possible, I trawled youtube and found the offending match. Surprisingly, I had no problem with the attack on the floor. It looked as if the attacker had aimed for men, and if the referees had not called yame, this was perfectly legal. What did attract my attention were several taiatari attempts where the culprit was pushing at chin height and it was the last of these that “decked” his opponent. In my view this is unforgiveable. Taiatari should be at waist height and if you happen to nudge the opponent out of the shiaijo then good for you, but pushing to the face to either disorientate or weaken your opponent is just not kendo. I do not know what the referees decided as the the video showed them stopping for gogi. I did not see a hansoku given, but that may have been because of the video rather than the shiai outcome. Had I been shushin however, I would have penalised each of the pushes with hansoku.